Before I review this film properly, let me make a quick detour. Consider this an open letter to those in charge of American entertainment. I have two very important things to tell you that you don’t seem to know. One – we’re not stupid, so please stop taking foreign properties and dumbing them down for U.S. audiences. And two – 95% of the time professional voice actors are better than big name celebrities. Arthur isn’t just an animated film – thank goodness. 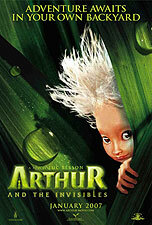 Arthur And The Invisibles begins as a live action film (and switches back and forth throughout between live action and CG animation). Arthur is a 10 year old boy who lives in 1960’s Connecticut and things aren’t going all that well for him. His parents are busy searching for work in the big city and have left him in the care of his Granny. Granny’s husband Archibald (a retired African explorer and engineer) has been missing for some time. Arthur misses his parents and wishes they could all be together as a family again, but he does find solace. The home he shares with Granny is filled with all the accumulated books, knick-knacks, and notes from his grandfather’s travels. Granny tells Arthur of their time with two African tribes, the very tall Matassalai and the very tiny Minimoys. In appreciation for the help he provided them Archibald is rewarded with rubies. As Granny is about to be evicted from her home in two days time so the land can be flattened for land development this treasure would come in very handy, but unfortunately Archibald buried it in their back yard to keep it safe and now it has been lost. Arthur takes it upon himself to find the treasure in time to save the house and must travel to the world of the little people in his backyard to find it. However, the evil Maltazard has other ideas, and plans to rule the entire tiny kingdom by destroying the Minimoys. The film has a couple of big problems. And they are almost enough to ruin the whole thing. Fortunately underneath it all is a pretty good movie trying not to be drowned by its problems. The two most glaring issues are those I mentioned at the beginning. The first of these is the “dumbed-down” factor. The most obvious evidence of this is the title itself. The book from which the film is based and the original French version of the film are titled (in English) Arthur And The Minimoys – which makes complete sense story-wise. But my guess is some “creative executive” somewhere decided American audiences wouldn’t go with a film with a word they didn’t know in the title. So it was dumbed down to Arthur and the Invisibles – which, while not making much sense even in the context of the film, is at least filled with real English words. Worse though, the live action parts of this film are very charming and really make you want to like the movie. But from the very first minute an animated character appears the whole feel of the film changes from charming to smart-alecky. The characters go from likable to annoying. And the driving factor here is probably executives who feel that American audiences want that modern, hip, sassy, and sarcastic vibe from their animated movies since that has sold so well in the past. How does this manifest itself in the film? Obviously the dialogue, but also with the choice of voice actors – my second complaint from above. If a famous actor also did some art on the side would we want them involved in the animation process just so we could attach their name to the film? Then why do we do it with the voice acting?! There are so many talented professional voice actors out there who could make so many of these average animated films of late so much better. But again Hollywood equates big name with big box office and sacrifices quality for what they hope will be financial quantity. With the exception of Madonna as Princess Selenia, just about every animated voice in this film would have benefited from a real voice actor. Instead big names in music, movies, and television take those jobs and deliver sub-par performances. Don’t get me wrong, these people are great in their usual jobs, but voice acting is a completely different profession, and takes more than the ability to talk well! The film also suffers from a few more minor issues. One is a tendency to rush through every scene rather than take the time to more fully develop the characters or the plot itself. An example here would be a quick scene where Granny starts to sell Archibald’s possessions to make some money. Yet later every item Arthur needs to solve the puzzle of getting to the Minimoy world remains, including a very expensive looking telescope. Another, which was also evident in director Luc Besson’s The Fifth Element, is not clearing up or explaining important concepts of the film for the audience. Glaring here is how two African tribes ended up in a backyard in Connecticut! The last minor quibble is the story’s “borrowing” of ideas from other sources. The most obvious lift is the sword stuck in a stone that only a character named Arthur can pull out. I’ve spent a lot of time pointing out the faults of this film. However, the truth is I actually thought it wasn’t too bad! But it was so close to being a great film, which makes the problems all that more exasperating. So let’s talk about what was good about Arthur. The live action segments of the film are almost all wonderfully done. The writing, the acting, the sets, cinematography – it all works. Freddie Highmore, as our title character, is very endearing in the live action segments, and does a good job voice acting in the animated parts. 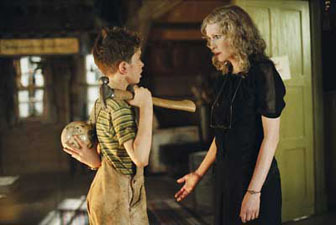 Mia Farrow shines as well as Arthur’s long-suffering Granny. Surprisingly, for all my complaints about big stars doing voice acting, Madonna does a more than passable job as Princess Selenia. And the animation is good, with some very unique designs – something sorely missing in this glut of cute fuzzy animal films we seem stuck in. The fun factor is also relatively high here with lots of action sequences, some cool designs, and an entertaining story. Arthur And The Invisibles isn’t going to win any awards – especially now that the Academy has pulled it from consideration for the Animated Oscar. But it is a fun film that most kids and even adults will probably enjoy. It just could have been so much more. And one last note to those in charge of American entertainment – for the love of all that is good, please keep Jimmy Fallon away from the microphones of your animated films!